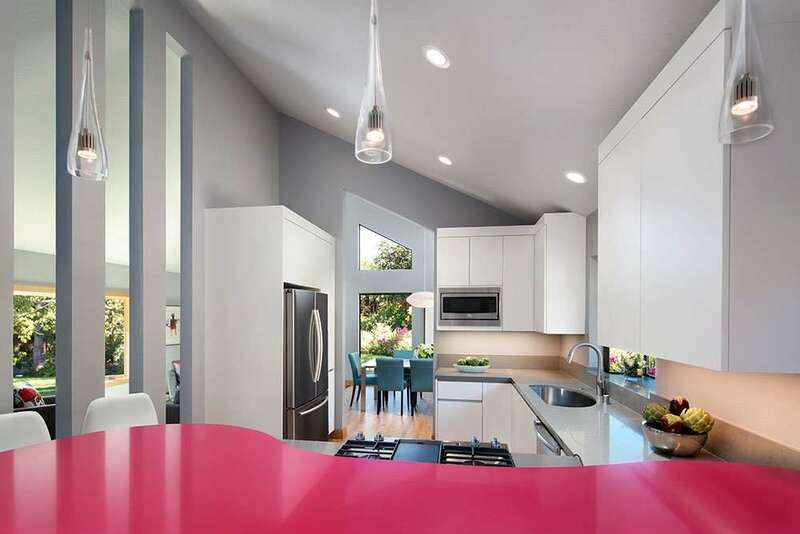 Most homeowners are intrigued to know the hottest kitchen and bathroom design trends and what materials are currently being used in ultra-modern homes. And when they are ready to remodel their own residence, homeowners want to ensure the firm they choose for their remodel project is intimately aware of the latest trends, materials, and design. That’s why Harrell Remodeling makes it a point to send at least one of their designers to the annual Kitchen & Bath Industry Show (KBIS) to observe and track emerging trends. KBIS is the world’s largest kitchen and bathroom tradeshow where cutting edge designs and trending themes can be experienced firsthand. This year, the company sent two of its designers to perform reconnaissance on behalf of Bay Area homeowners. The two returned with an amazing list of noteworthy styles that will be evolving in the next year or two. This year, Harrell Remodeling senior designers Sara Jorgensen and Debra Winston attended the KBIS show, returning with valuable insights into current and leading trends for their clients. “The KBIS is such a huge show. We walked 21 miles and took 21,000 photos. The experience inspired us and we were able to identify design trends and techniques that will absolutely translate to more amazing Harrell Remodeling results for our clients. These trends are happening now, but will also be emerging in the future,” said Sara. In general, Sara explained that there was a clear distinction between East Coast design trends and West Coast design trends. “East Coast styles are still very traditional. They are using lots of detailing, and decorative cabinets. But when you see the West Coast styles, they are all frameless cabinets with clean lines and very contemporary,” said Sara. Everywhere Sara and Debra went, they saw walnut finishes dominating kitchen and bathroom cabinets. This rich walnut finish is replacing the white-on-white look that’s been popular for traditional kitchens and baths. Walnut is not relegated to just the exterior of the cabinetry but is also being used on the inside of cabinets. Sara and Debra observed that many modern designers are skillfully combining the color white with walnut in a variety of ways to showcase the trend. The use of sleek, under-cabinet, energy-efficient LED lighting was clearly an emerging trend. Manufacturers are developing thin lighting tape that can be used throughout both the bathroom and kitchen. The use of lighting was everywhere, but most prevalent in the skillful illumination of the undersides of counters and cabinets. In many cases, this sleek under-counter lighting highlighted the walnut and white finish on upper cabinets. Both designers discovered that gold is being extensively throughout many of the kitchen and bathroom designs they toured. Gold is used sparingly to accent beautiful walnut or other wood finishes. It is also elegantly paired with navy blue. This trend of navy blue and gold was used frequently in kitchen islands or perimeter cabinets, where small gold lighting or cabinet fixtures accentuated the rich blue. The use of bright reds, blues, and yellows were prevalent throughout the show. For example, many appliances are now sporting bold colors to add some spark to the kitchen. Daring colors are being combined with textured metal in apron-front sinks. Another unique manner in which color was incorporated was by painting the insides of cabinet drawers with bubble gum pink or other playful hues. One of the most visible themes Sara and Debra noted was a focus on televisions above fireplaces. As the designers explored this theme further, they realized that fireplaces are now being manufactured in such a way that they can be paired closely with a large, suspended television. Many high-tech fireplaces incorporated LED lighting trim around their perimeter with the lights changing color to coordinate with a favorite sporting team or to set a mood. Also, there were clever ways of concealing the television behind a large piece of art when not in use. The TV was secured to hardware allowing it to swing down, under the artwork and in front of the fire for easy viewing. While not every homeowner will use all of these ideas and concepts in their remodeling project, they do provide a great framework for future design ideas. In addition, the concepts have been instilled into the deep arsenal of talented designers at Harrell Remodeling, who are always looking for the next great design solution! Because the KBIS show was so immense, Harrell Remodeling has incorporated some of Sara’s and Debra’s notes into a “Hot Trends in Products, Design and Remodeling” seminar that are part of the firm’s regular informational series of workshops and presentations for the Bay Area homeowners. With locations in Palo Alto and Los Gatos Harrell Remodeling has been designing and remodeling distinctive homes since 1985. We invite you to stop by our “Jewel Box” Showroom, attend one of our workshops, or schedule a complementary appointment to learn how we can make your remodeling vision come true. We wanted to let you know that we had our first major entertaining event last weekend with a party for my library staff. Everyone was very impressed with the remodel and I spent a lot of time showing off various features to the guest.